When professional cakes go horribly, hilariously wrong. 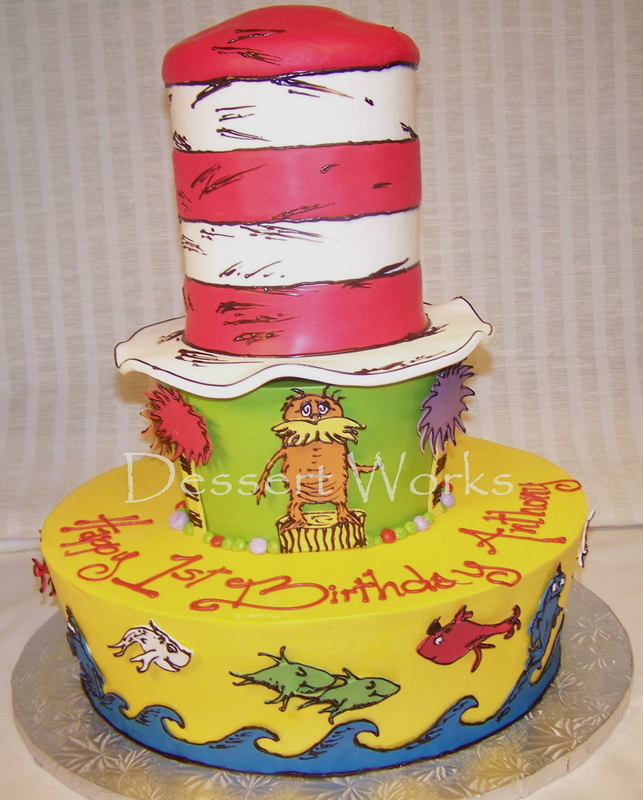 In honor of Dr. Seuss' birthday last week, let's take a look at some Sweets that would make the good doctor proud. Look at that razor-sharp edge! That is some awesome icing work. Have a Sweet to nominate? Then send it to Sunday Sweets [at] Cake Wrecks [dot] com. Update: We got a late entry today that was too good not to post. These were amazing. I think the Thing 1 and Thing 2 cake were my favorite... But the wedding one. Ah. So gorgeous. I loved the 4th and the 4th from the bottom! Now it makes me want a sculpture of the 4th. That last one is amazing, I'm so curious how they pulled it off, same thing with that gravity defying one in the middle. I am truly astounded! Those cakes were awesome! However, the cake you said was a baby shower cake looks to be a Birthday cake. Sorry!! Dr Seuss on Sunday Sweets! I ♥ Dr. Seuss! 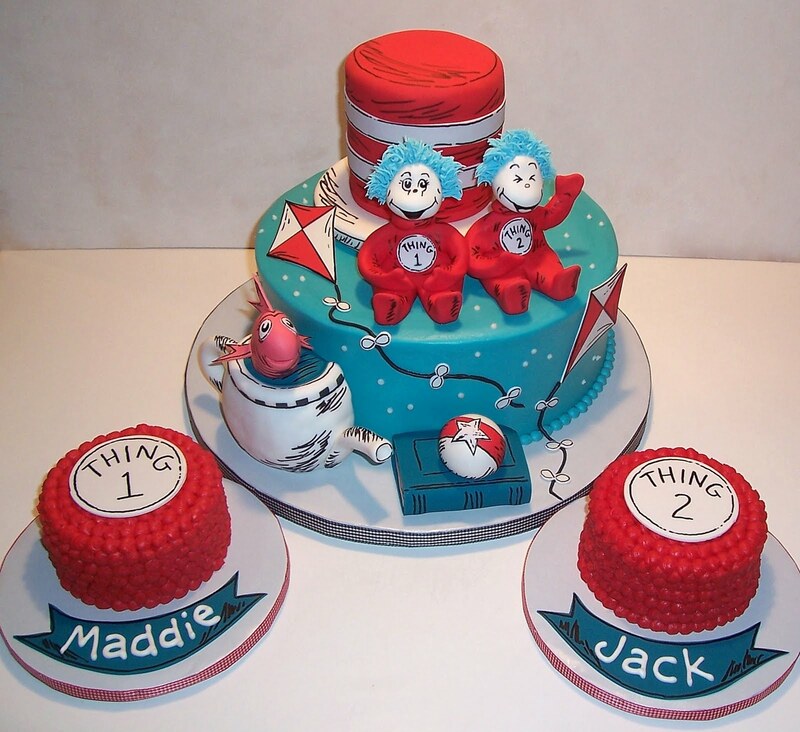 Love the Thing 1 and Thing 2 cake, and especially the "Fish in a Pot." Whenever I see one of those (intentionally) lopsided cakes, I always think of Dr. Seuss! It's nice that we can bring some of that whimsical world into ours. Now if automakers would just start making open-air cars with a separate cockpit for each person, then we could really start enjoying life! Oh, yeah, the safety issues. Well, we still have the cakes! I'm a huge fan of your blog, read it everyday so I was thrilled to check in today and see my cake! The cake by Glenda was designed by her for my baby shower and entered into at least one competition which is where it looks like this picture is taken. I still have the fondant characters, three years later! I have no idea how she made the stripes but it was gorgeous and yummy! AWESOME cakes!!! I am stumped at cake #4, like you said "defies the laws of gravity!" Same with the upside down cake! That's crazy! Ohhhh! I LOVE the upside down wedding cake! But all of them were fabulous! Green Eggs and Ham was one of favorite books too! These are all fantastic. Thanks so much for finding them. These are all sooooo amazing! 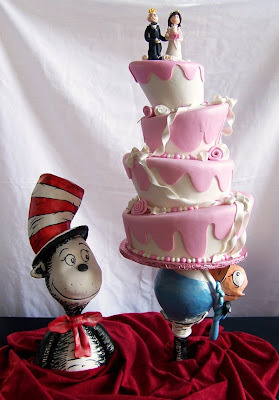 My twins are having a Seuss themed birthday coming up! I can't wait! The upside down cake is not only too nice to slice, it's impossible to slice! Very cute cakes...all of them. I was in Seussical the Musical. I was the Cat in the hat! Yeah I love Dr. Suess. Now how the heck do you hang a wedding cake? Googling now. Thank you thank you for posting this! I LOVE these cakes! Ok, I absolutely LOVE Things 1 & 2, but that gravity defying cake is to die for! 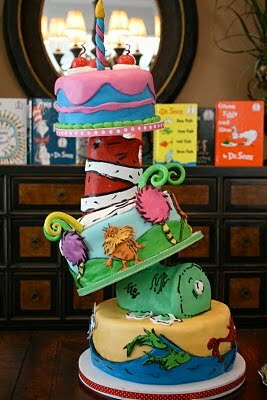 LOVE LOVE LOVE me some Dr Seuss!!! Awesome! This is my favorite "Wreck" post ever! How on earth do you cut a cake that is hanging from the ceiling? You'd need a drop cloth, I'm thinkin'. How the freak do you get a cake to hang upside down? that has to be a flipped pic! These are all so beautiful!!! Wow! Those are amazing. All of them! Ceiling cake?! I think I have found my new favourite thing. Also the stripes on that cake have to be painted, they are perfect! How? How do you hang a cake from the ceiling? How? Upside down cake is very interesting...but how do you cut it?? Just guessing on the stripes: I suspect there's an undercoat of fondant to build on, then the stripes either cut and placed on or painted on with very well-done edges, and then the seams/edges covered by that thin strip/roll of black, which could be piped, fondant, or even sugar veil. Either way it's superbly done. Bravo! Oh, my! Those are all amazing. I want to know if the wedding couple were suspended upside-down to do the traditional first-slice picture. And, if so, I want to see it! Hand cut lettering? Holy smokes! I *might* attempt to do something like that on my Silhouette but NEVER by hand. Big ups! Seriously. The upside-down cake is beyond FAB! Are you sure those were hand cut letters and not made by a Cricut Cake? That's a familiar looking font. The upside down cake wouldn't be so difficult to do, if you put each cake on a plate, and have all of the plates connected by the chain. The smallest plate on the bottom, of course. 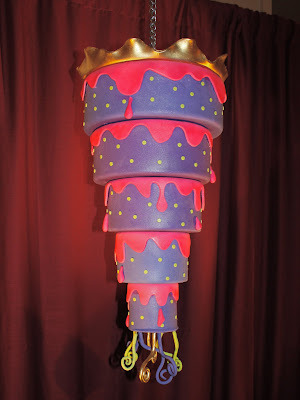 Out of curiosity, I Googled how to do the upside-down cake as shown, and I got this video from YouTube: http://www.youtube.com/watch?v=DIZokqDkrPg It's also called a chandelier cake. The gravity-defying one, however, is still puzzling, but all are gorgeous cakes! I believe I have a good idea how they accomplished the upside down cake, but how in blazes to you SERVE it? 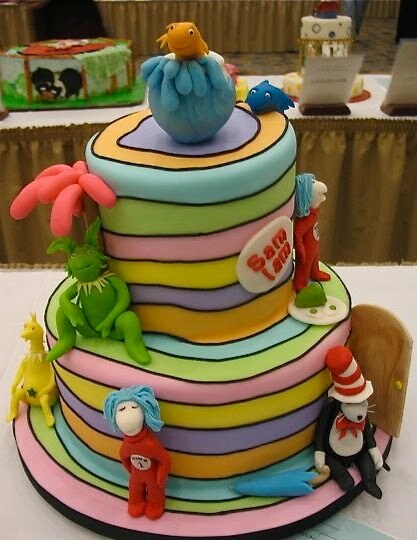 As for the stripes, I'm guessing they were rolled out in the fondant, the same way you would with sculpey or fimo. wv: sangu. Sangu for providing us with such nifty sweets! 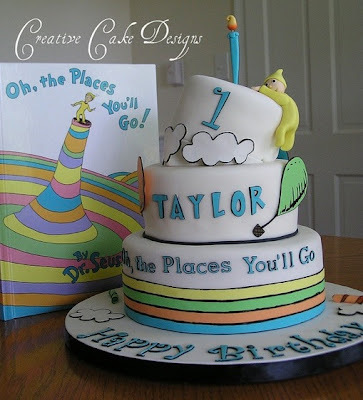 Love the Seuss cakes - gorgeous and fun! Is it possible that the one hanging from the ceiling isn't a "real" cake? Maybe it's rice crispie stuff covered with fondant. They do that a lot on those cake shows on tv. It would be heavy, but a lot easier to stick together than actual cake. Or could it be styrofoam? Or a pinata? That was my 5-yo son's reaction. Okay, here's my theory on the upside down cake. I think they cut a whole in the center of each cake, then, starting with the smallest cake, put it on a plate with a chain through the center that goes through the cake above it and the one above that... So, each cake actually has a plate at the bottom (which looks like the top of each cake) that attaches to the very top. that upside down cake is mind boggling. I think that the stripes on that cake were probably made with thin snakes of black fondant. at least, that's what it looked like to me. I'm the maker of the hanging cake :) Thanks for sharing Jen and thanks for all the lovely comments. Love all the cakes on this Sunday Sweets! For those who can't read the cupcake third from the left in the top row, it says, "Don't cry because it's over. Smile because it happened. --Dr. Seuss." How do they do the lopsided cake, the one that seems to defy gravity? Ok, I am totally awestruck by those creations. I want to renew our vows just so I can has a seuss cake! 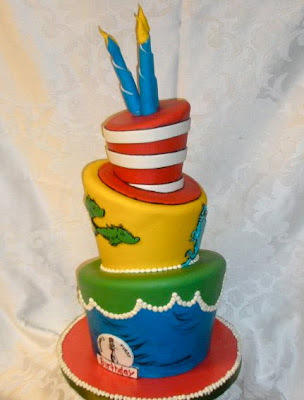 Am I the only one who feels slightly gipped by one of the cakes being a repeat from last year's Seuss-themed post? They are amazing though - love the upside down cake! Chrissie - I'm just wondering, by "bottom layer" do you mean the smallest or the biggest? I love the green eggs and ham! And the upside down cake...probably not the colors I would choose, but I really like the uniqueness of it. This, by far, was my favorite post ever. Absolutely. Thank you for some true treasures ... love, love, love 'em! Lori - I'm not Chrissie, but have seen the hanging cake in person! By "bottom tier" she means the smallest one. Hope that helps! Would you like your wreck here? Would you like your wreck there? absolutely my favorite wrecks Sunday Sweets ever. Love Seuss, and thanks to you all for sharing this. Love you guys too. Dr. Seuss was the shiz. Wow to that gorgeous wedding cake hanging from the ceiling..just wow. 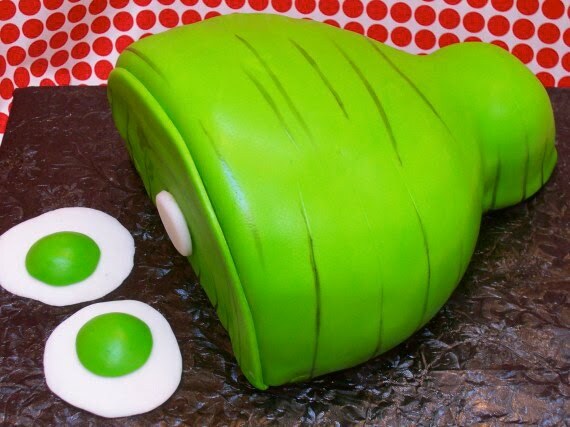 I also loved the green eggs and ham cake. Too darn cute to eat! 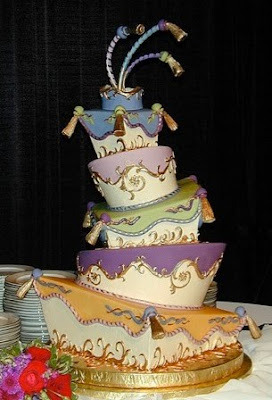 i am just dying to know how that cake isn't falling to the floor - a hanging cake!!!! but seriously, how? even if the bottom is attached to the top - the layers should be falling!!!! This is Glenda Goodwitch - The stripes are fondant. The seams between the colors are hidden with the black fondant rope. Where the stripe meets on the bottom tier the door is positioned and on the top tier the tree is covering the seam. Somewhere on YouTube I do have a video on making the stripes for my cake club. These are all wonderful. As for the striped one, I bet she tacked the stripes (well, rings more likely) to a sheet of white fondant, than ran it all through a sheeter to compress it. That would also explain why the stripes aren't perfectly straight. This is my favorite CW post ever. And I love that two of the bakers came on to offer their insight. Totally awesome. How??? the upside down cake...HOW??? A Cake Wreck is any cake that is unintentionally sad, silly, creepy, inappropriate - you name it. A Wreck is not necessarily a poorly-made cake; it's simply one I find funny, for any of a number of reasons. Anyone who has ever smeared frosting on a baked good has made a Wreck at one time or another, so I'm not here to vilify decorators: Cake Wrecks is just about finding the funny in unexpected, sugar-filled places. "I was laughing so hard, I couldn't catch my breath." "As funny as the blog that started it." "WAY better than I expected!" "Cake Wreckery at its best!" 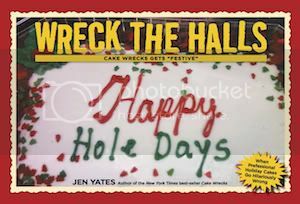 We don’t have any copies of Cake Wrecks for sale here, autographed or otherwise. We decided the shipping and handling costs would be too high to make it worth your while. So instead, buy your copies locally or online and then order personalized bookplates: it’s cheaper, easier, and I think even looks a bit nicer. Payments must be made through Paypal, which accepts all major credit cards. Sorry, but that means no checks or MOs or barter-based chickens. We ship everything first class USPS, and will do our best to have your package in the mail within 2 days of your order. Wreckies of the Month: The Cake-Free Edition! Way To Use Your Head! The WHAT of the Irish? Endorsement Disclosure: Purchases made through Amazon affiliate links on this blog yield a small referral fee. Go here for more details.